I love my mom’s chili. There is just something about the delicious combination of beans and flavors that always make me happy. The best part of my mom’s chili isn’t just how good it tastes, but how good it tastes after being frozen. This chili is seriously the best freezer chili. Make a large batch now, freeze half and you a meal for tonight and a night in the future. I love to make extra now because I know the holidays are going to be nuts! Combine all of the ingredients into a large pot. Bring to a boil and then reduce to a simmer. Cook for 2 to 3 hours, stirring every 15 minutes. Serve with warm bread. If you are making a freezer version add the chili to several containers and freeze. When you are ready to serve, run the container under hot water to loosen the chili from the container and then add the chili to a crockpot or pot and cook over medium heat until the chili is hot. Serve the chili with cheese, sour cream and green onions. This chili will keep well in the freezer for 2-3 months. Oh I love Chili! Especially when its a freezer meal. I need to remember this! I love chilli! You can always tell where a person is from by whether they eat their chilli with bread or with crackers! This sounds like the perfect recipe for fall. 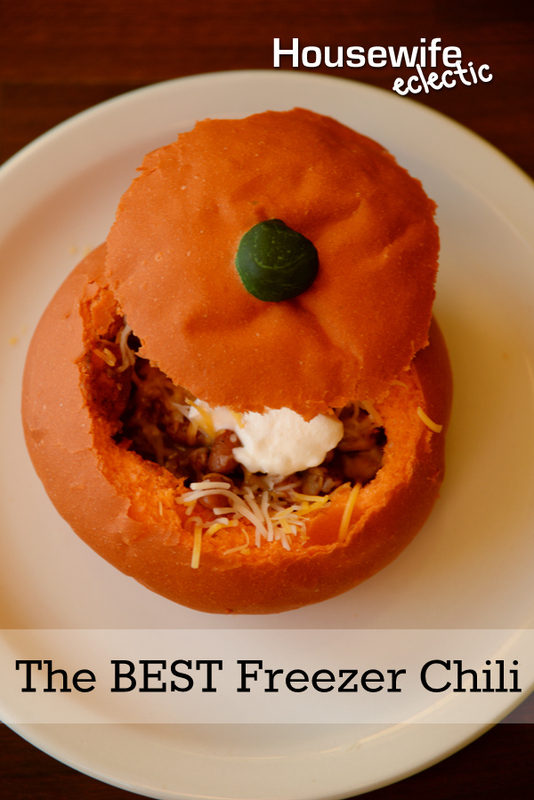 I love how cute it is in the bread bowl as well! Chili sounds really good right now with it being foggy and rainy down here. Freezer meals are the best! I'm going to add this to my list of freezer meals to have ready for when the baby comes! Chili is one of my favorites! We have it every other SUnday. That looks so delicious. I love chili! It's one of my favorite dishes. chili is always a good, quick meal. great for freezing. i never know what i can freeze and what i cant. My husband loves finding new ways to make chili so I'm going to have to show this to him. It looks amazing! I love all freezer meals and my family definitely loves chili! 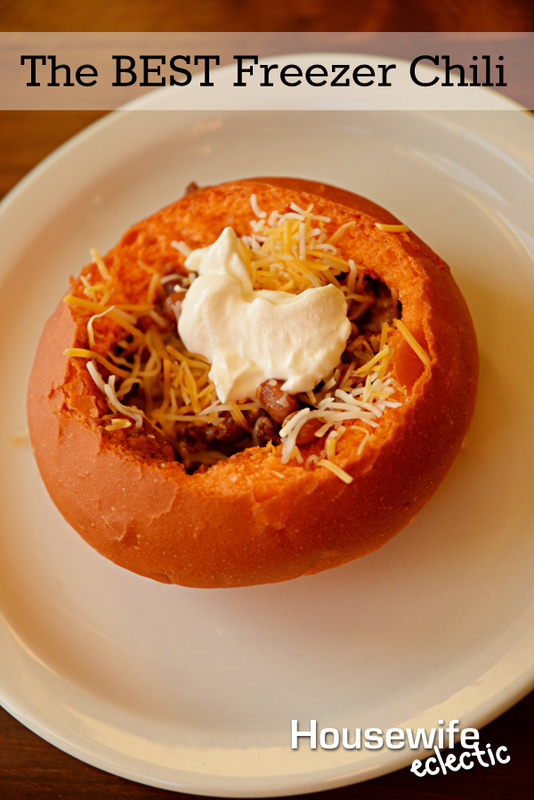 Fall and winter are the perfect seasons for chili. This recipe sounds delicious. I bet it work great with ground turkey too. This is so creative! I love chili, it's so great and to do this in the freezer, how interesting. This is such a great idea. I always seem to want chili but either don't have the ingredients or don't want to make a ton. This is a great way to have it when I want it! This seems easy enough and looks yummy. I need to make more freezer meals and plan ahead. This looks delicious! My favorite freezer recipe is borscht. It freezes very well. Love your bread bowl! Omg nothing better than a bowl of chili on a cold fall night. I so need to give your recipe a try! This looks so yummy! We have yet to have chili this year I cant wait! This looks truly awesome! Delicious and great presentation! How much does the recipe make? I can’t wait to try it.